The Big Idea: Children need to know that you can work together, stay safe, and be prepared in an emergency. It’s hard to know what to say when talking to children about emergencies. You don’t want to worry them, but it’s important for the whole family to know they can work together to be prepared. These tips will help you talk to children about emergencies, while calming their worries. Stay calm and reassure children that you are here to help them and keep them safe. Talk about your family’s emergency plan together so they will know what to do if an emergency happens. Explain that an emergency is when something happens that we don’t expect, and we have to act quickly to keep ourselves safe. Team up Let children know that you can work together to get ready for emergencies, just like you get ready for a car ride by wearing your seat belts, or by wearing helmets on a bike ride. 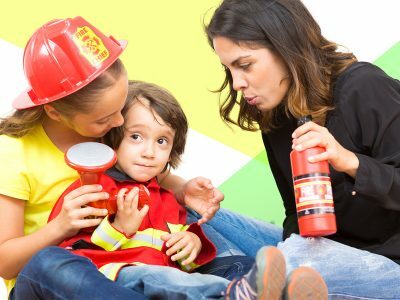 Look for helpers Remind your child that there are so many helpers we can trust to keep us safe in an emergency: teachers, firefighters, emergency responders, doctors, and police officers. Even if a parent is not around, other special helpers will be there for them.